It’s difficult to look at Mark Buxton’s body of work and not be impressed, after all this is the man that created many of the great Comme des Garçons scents (CDG EDP, 2, 2 Man etc) and Le Labo’s Vetiver 46 to name just a small few, and he is a perfumer with a very distinct style and approach to the art of olfaction. So when Perfume Lovers London (a fantastic group that organises monthly perfume meet ups) offered up tickets for an evening with this renegade perfumer to discuss his creations for designer houses and his very own collection, one would have frankly been an utter fool to miss out – and miss out I certainly did not. Mr. Buxton, with his jumbled anglo-french-german accent, is unsurprisingly an engaging character. He started the evening by discussing his interest in odour from a young age, always being fascinated by the odours, not the flavours, within the kitchen of his parents restaurant – odours such as roast chicken (which I think we all can agree is possibly the best smell on earth) amongst others. Buxton’s introduction to perfumery is as unlikely as it is fascinating and he snappily summed his career up by describing himself as a “perfumer by coincidence”. Starting out with an interest in studying fashion, Buxton and a friend wrote to German TV show Wetten, Dass betting that they could recognise all of the perfumes in the department store Douglas. Luckily for Buxton the people at Wetten, Dass were very keen on the idea and called straight away to get him and his friend on the show. Through sourcing and sniffing all of the samples Buxton discovered his talent for recognising odour families, using a spacial technique of slotting odours in to ‘drawers’, and whilst he may have lost his bet on live television Buxton had taken his first few steps in to the world of perfume, a world in which he now finds a permanent home. Following his TV appearance Buxton was faced with a career dilemma, having received simultaneous offers of a place at perfumery school by Haarman & Reimer (the first company to create the fragrance genealogy), a place at fashion school and an offer to present on Television following his successful one-time appearance – thankfully for us Buxton chose perfumery and the rest, as they say, is history. After a brief introduction to his beginnings we got to talking about and perhaps more importantly got to sniffing the perfumes. The main focus of the evening was placed firmly on Buxton’s creations for avant-garde Japanese fashion label Comme des Garçons, perfumes for which both he and the brand are famous for. In a display of excellent perfume synchronicity Buxton’s first submission managed to win the highly confidential brief for Comme des Garçons very first perfume – Comme des Garçons Eau de Parfum. The brand was looking for something that “wasn’t commercial” so Buxton gave them his olfactory interpretation of a Moroccan souk. 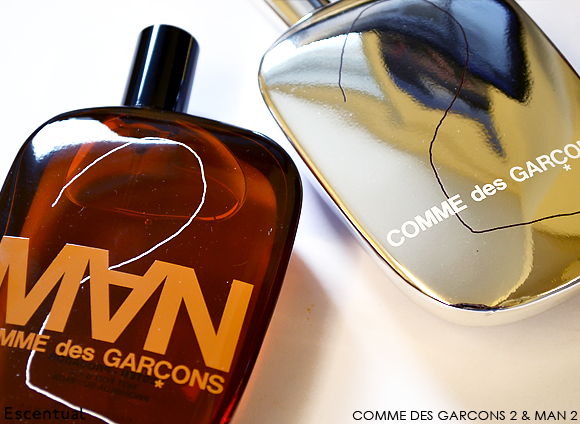 The result (CDG EDP) is a beautifully rich oriental awash with cinnamon and rose. Upon its release in 1994 the scent felt entirely new whilst hinting at great spice bombs of the past such as Estée Lauder’s Youth Dew and Yves Saint Laurent’s Opium. What is perhaps the most surprising part of CDG EDP’s story is that the first formula submitted by Buxton was the final version bottled and sold. Buxton joked that after going through a series of 126 modifications the brand wanted his original submission, something that doesn’t often happen in modern perfumery, with most perfumes going through a series of modifications before release. As Buxton says “the Japanese are very faithful” and Rei Kawukubo (CDG’s founder) continued to employ him to create the brand’s perfumes. It was this successful partnership that brought the world Comme des Garçons 2 (milk, flowers and ink) and Comme des Garçons 2 Man (incense, spice and snuffed out candles) – two cult favourites that are icons within their respective genres and showcase some of Buxton’s favourite ingredients (his “MB DNA” as he calls it) such as incense, aldehydes and rhubarb. Comme des Garçons 3 followed in 2002 and is perhaps Buxton’s most unusual creation for the house. Utilising an “overdose of rose oxide” blended with cassis, CDG 3 is a sharp, cold and milky perfume that evokes the image of a sparse, minimalist and futuristic environment. It is perhaps one of the most underrated perfumes to be released by the brand. Buxton also spoke of the length of his formulas, which average at about 20 ingredients, a figure which is considerably less than many of his contemporaries who can use hundreds. One cannot be anything but amazed by the fact that his palate only consists of approximately 300 materials yet he has the ability (and talent) to create endless combinations of scent. The rest of the evening was a look at Buxton’s greatest hits for a variety of brands, including his own. Personal stand outs were the highly sought after “unifaith” fragrance for Elternhaus entitled ‘Moslbuddjewchristhindao’ – a fascinating woody fragrance that incorporates notes of Jewish black bread, old leather, incense and pepper, the skanky jasmine fest of À Rebours by Friendly Fur – an animalic roll on the forest floor amongst the moss and foxes, and the deliciously fruity osmanthus with a hint of hot skin of his very own perfume Sexual Healing. This writer for one will always be interested to see what that “something new” may be. 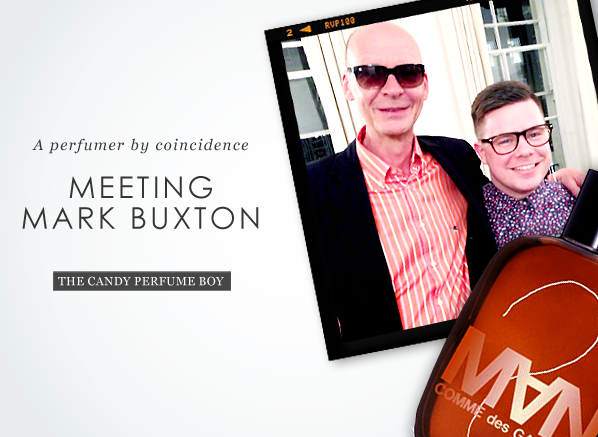 Mark Buxton Perfumes are now available at Escentual – shop here. This entry was posted on Thursday, May 23rd, 2013 at 11:51 am and is filed under Candy Perfume Boy, Fragrance, Guest bloggers, Special Post. You can follow any responses to this entry through the RSS 2.0 feed. You can skip to the end and leave a response. Pinging is currently not allowed.